The fundamental and explosive changes in the U.S. economy and its business system from 1860 to 1920 continue to fascinate and engage historians, economists, and sociologists. While many disagreements persist about the motivations of the actors, most scholars roughly agree on the central shifts in technologies and markets that called forth big business. Recent scholarship, however, has revealed important new insights into the changing cultural values and sensibilities of Americans who lived during the time, on women in business, on the ties between the emerging corporations and other American institutions, on the nature of competition among giant firms, and on the dawn of modern advertising and consumerism. 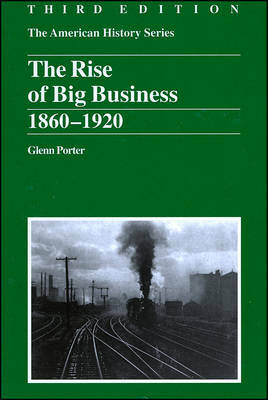 This vast accumulation of notable new work on the social concept and consequences of economic change in that era has prompted Glenn Porter to recast numerous portions of The Rise of Big Business, one of Harlan Davidson's most successful titles ever, in this, the third edition. Those familiar with this classic text will appreciate the expanded coverage of topics beyond the fray of regulation and the political dimensions of the emergence of concentrated enterprise, namely the influence of the rise of big business on social history. An entirely new bank of photographs and illustrations rounds out the latest edition of our enduringly popular title, one perfect for supplementary reading in a variety of courses including the U.S. history survey, the history of American business, and specialized courses in social history and the Gilded Age.